You Are Here. Jump to other pages. As the cost of copper continues to rise, garden railroaders are looking for ways to cut costs, including ways to make the best use of their existing investment in Code 332 track (the kind LGB pioneered). Because the rails of the old track are so sturdy, they usually outlast the tie strips, the rail joiners, and even the roadbed they're installed over. The good news is that if you've got rails in good shape, you can usually make your track sections "like new" (or in some cases "better than new") for 1/3 or less of the cost of new track. Update for 2014 - In late 2013 AristoCraft went out of business, but their track is still being sold for the moment as GeneratioNext track. In fact, all of the "GeneratioNext" track I've seen so far has "Aristocraft" molded into the bottom of the tie strips. In addition, USA Trains track is identical except for the color of the brass when it's new. 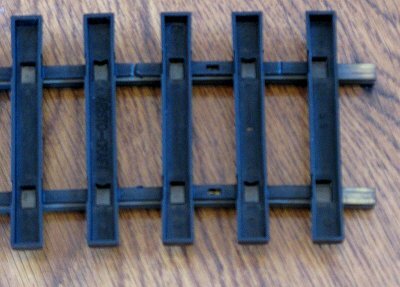 And Bachmann's brass track is compatible with both, so tie strips, rail joiners, etc., should be compatible. Technically "GeneratioNext" was out of tie strips when I tried to purchase some in October, 2014, but they say they expect some in early 2015. However several vendors still had them in stock recently, so shop around. Rail Joiner Issues - Some times the rail joiners have also failed. Even if they haven't, if you find yourself rebending rail or replacing ties, you should think about replacing any that are getting "dicey." Also, if you've only used slide-on rail joiners in the past, this could be a good time to consider screw-on aftermarket joiners. 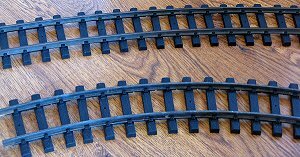 Or if you have Aristo track, and the old rail joiners are getting a bit "sloppy," consider on replacing them when you replace the ties. In some cases, you can tell that a tie strip has gone bad because the rail is simply pulling away from the ties. In other cases, the symptoms are more subtle. You may have a bit of track that certain cars or locomotives always hang up or derail on. The track section shown at the right is from my portable Thomas railroad. This track section used to derail Annie and Clarabel, but not Thomas or James. In fact, heavy trains of any sort ran fine. When I was setting up the portable railroad most recently, I noticed that the outside rail had too much inward flex because a few of the plastic "tie plates" had given way. Rolling stock that was too light (like Clarabel) wouldn't put any "outward" pressure on the track as it passed. Replacing this track section "fixed" that part of the railroad in a hurry. On the other hand, I still needed to "fix" that piece by installing a new tie strip. As an example of a more obvious problem, I had some old Delton track that simply fell to pieces when I tried to move it recently. The tie strips had largely broken down into a black powder that was in no danger of holding the rails in place once I nudged them at all. Somewhere in between those two was my oldest loop of AristoCraft track - outdoors for something like 15 years. The ties just started giving out along certain stretches. (AristoCraft has changed their tie formula since this track was made, so don't let this photo panic you.) In a few cases, like the one shown at the right, the rail was only being held to the ties every several inches. Believe it or not, thanks to the quality of the rails, most trains could still run on the piece of track to the right, but very light pieces like my Bachmann street cars could not. Fortunately, since I was the original purchaser, AristoCraft replaced those tie strips for me under their lifetime warranty. I tried some of the AristoCraft tie strips on the Delton rails and they worked great on those, too, so I've ordered extra strips for those and some other odds and ends. Llagas Creek, AMS, and a few other manufacturers have used Code 250 rail (about 1/4" high). Most Code 250 Large Scale track hasn't been around long enough for the ties to fail. However, when that does happen, consider getting replacement tie strips from the original manufacturer, or trying a sample before you buy a bunch - I'm told that not all Code 250 track follows the same profile. As an example of options available for replacing the tie strips for Code 332 rail, here's a table of AristoCraft's tie strip products and their last advertised "list prices." 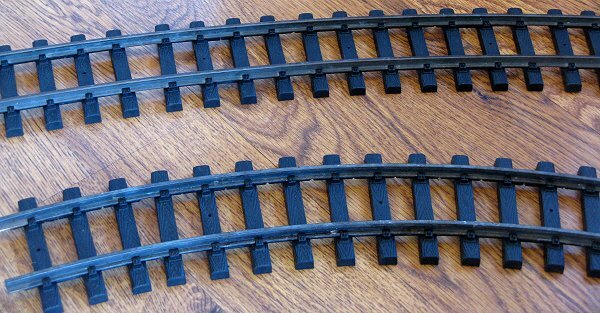 If you're refurbing LGB track or modeling in narrow gauge, consider Aristo's "Euro" tie strips - they're a pretty good match for LGB's. ART-11004(B) 1' track tie strips, redesigned for any curve or straight, Euro Style ? ? Most garden train track has slip-on rail joiners of some kind, but sometimes getting them disassembled from the rail is more complicated than you might think. LGB railjoiners slip together when you join the track. But each railjoiner has a tab that helps keep it and the rail it's attached to in place. Look for that tab before you try to pull the tie strip off the rail. My friend Ric Golding says "I have found the best solution is to drill out the dimple, bend the tab and pull joiner off with needle nose pliers." AristoCraft railjoiners provide little holes for screwing the railjoiners to tiny holes that are predrilled in the rail. Personally I like this sytem, but it has taken more than one casual garden railroader by surprise, when they started to disassemble a circle of track, then realized that someone else had screwed everything together. Trying to pull such an installation apart by brute force will ruin the rails, so please resist the temption. Aristo's early track screws required a tiny Phillips head screwdriver. Later screws use a tiny Allen wrench. Both kinds came with tiny screwdrivers originally, although the little Phillips head screwdrivers always stripped out after an hours' work anyway. You can get a far superior replacement for the Phillips head screwdriver from an electronics supply store. If you've ever bought or been given an Allen wrench set, you probably have an Allen wrench that is compatible with the Aristo rail plate screws. 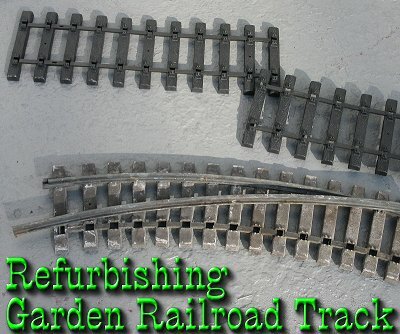 Other Railjoiners - Most other brands of garden railroad track come with railjoiners that slip on in both directions. If they haven't deteriorated or lost their shape, you can probably reuse them, although I alway recommend screw-on rail joiners for better connections. On the other hand, if your track already has aftermarket rail joiners, thank your lucky stars and remove them carefully, being carefully not to loose any of the little screws. See if there's anything peculiar about the existing tie strips. For example, some rail joiners have a little tab that goes down into the tie to keep it stable, which means that when you reassemble the track, you'll need to put that rail joiner in place before you slide the rail all the way through. Aristo Track has screws on the bottom of the tie strips which help keep the track stable. On 1' pieces this isn't a problem - you'll just make certain to slide the new tie strip on. On longer pieces, like the pieces for the 10'-diameter circles, you actually need about 2 1/2 strips per piece. To remove the tie strips, you'll need to remove the tiny Phillips-head screws in the bottom, but to to restore the track piece to optimum condition, you need to turn the strips so that the holes for the little screws align and you can put the screws back in place. In the piece shown below, using Euro ties, you slide two full tie strips onto the rails, then a partial tie strip. What do you do with the other ties that you cut off the partial tie strip? Well, I always have some odd pieces from other brands laying around that need new ties, too. By now your rails may have just pulled out of tie strips. But if they haven't, pay attention to which rails are the "outside" and "inside" rails. In fact, I like replacing tie strips on one piece of track at a time so I don't get confused on the really broad curves, where it's harder to tell the difference (but I'm easily confused, so this may not apply to you). If you have AristoCraft track, you'll notice that the tie strips are fastened to the rails from the bottom by tiny Phillips-head screws. So you'll need to unscrew those screws before you remove the tie strips. Save the screws; this setup really does make the track a bit more sturdy, and helps you run jumper cables easily. Again, be careful to protect the rail's shape when removing the tie strips or storing the rails. Code 332 brass rail can be bent into a shape that's hard to fix if you're not careful. While the rails are out of the tie strip, this is a good time to verify that they are not twisted by setting them on a flat surface. If they're twisted a little, you may be able to nudge them back in shape. If they're twisted a lot you may need a railbender to get them really straightened out. I don't recommend cleaning your rails up any more than necessary because you lose that cool brown color they've faded to. It took years of Ohio acid rains to get my rails to achieve the great dirty brown color you see in most of photos. Why go back to shiny brass? You also risk bending the rail into an unfixable shape if you're handling it roughly. Sometimes, though, a rail may be so corroded that you are afraid you will have trouble getting the new tie strip on. In such a case, you can use a very fine sanding pad or something similar, and use it as gently as possible. Again, be very careful not to bend the rail in any direction as you do this. Be certain that you have keep the "inside" and "outside" rail straight. Note about Aristo Track - If you have Aristo track and are using Aristo replacement tie strips, look for the end of tie strip that has the little holes for the screws to go in. Your Aristo track will be more sturdy if you take care to reassemble the track so that you can put the screws back in the way they came out. If you don't have Aristo track, or if you've lost the little screws and don't want to mess with replacing them them, this isn't exactly a huge concern. Look at How the Original Tie Strip was "Nipped." Aristo tie strips and several others come with connecting pieces on both ends of each tie, like little ladders. That's great if the track is straight. But if your track is curved, you'll need to nip some of the connectors on the outside edge. The ties in the photo to the right are from the old Aristo 10' diameter track. You'll notice that every other connector on what was the outside edge has been "nipped," except for the last three ties on the end. Again, if you have Aristo track and want to replace the little screws, one end of the tie strip has to be on the end of the rail with the little holes, so figure out which end that is before you start nipping. To do the nipping, I used a wire cutter - although you could use a knife or something else just as easily. The first piece I started with was an old 60" off-brand curve. The tie strip had been molded to curve, so I didn't have a model for where I would nip the joiners. So I was being cautious as I went. In case you wonder, for that piece, I wound up nipping between every outside tie except for the last two ties on each end. In most cases, I ran both rails through the tie strips at a time, once I got them started. If you are using LGB rail joiners, they have to go in as you replace the rail. Be sure you put them back the way they were before you took them off. If you have a track gauge, run it the length of the repaired length of the track. This will help you identify any places where the rail has been bent in such a way that the repaired track will be out of gauge. If you've treated your track carefully, this won't usually be a problem. But if the repaired track is seriously out of gauge, you may need to use a railbender to rebend one or both of the rails before reinstalling it on your railroad. If you don't have a track gauge, fasten a few pieces of track together and push a car over them to see if the car runs runs smoothly. Obviously, this is far more important for curves than for straight pieces. If you have track like Aristo that has tiny screws underneath, replace the screws once you've checked the track gauge. Follow the recommendations of the rail joiners' manufacturer. If you started with AristoCraft track (rails and all), your least expensive option will usually be to replace any worn or sloppy Aristo joiners with new Aristo Track Joiners. In that case, buying an extra set of track screws will help you save your sanity when you're doing the installation. 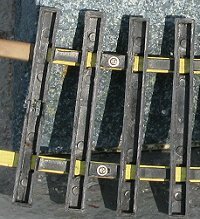 On the other hand, if you have some other brand of track, you might consider a screw-on aftermarket joiner such as Hillman (shown at right) or Split-Jaw rail clamps. I'd be delighted to hear anything you've done along this line, or any other maintenance tips you want to pass along to our readers. Please contact us with suggestions, corrections, photos, etc. And, above all, enjoy your trains, and any time you can spend with your family in the coming months. I am writing this to comment on your article, Refurbishing Garden Railroad Track. I have been receiving your newsletter for a while and enjoy reading it. I built my railroad several years ago . . . . This past summer I started remodeling my railroad and realized that about 80% of my track needed rebuilding. 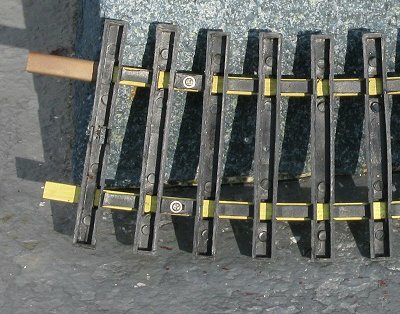 Instead of buying tie-strips, I salvaged the brass, which is a combination of LGB, Aristo Craft, and Kalazamoo, and decided to hand lay the track using ties cut from composite decking material and stainless steel spikes from Sunset Valley. I picked up an inexpensive ring-roller from Harbor Freight Tools, and formed the rail to custom radii. The rail needed to be straightened after peeling off the old tie strips; it didn't just need straightening, it had kinks, dips, and twists that had to be removed. I have built one turnout from the instructions in Garden Railways, and plan to replace at least four more turnouts with hand made ones as I have time. I have enough track complete and installed to run my trains, although I have only worked on about 15% of the railroad. Next summer should see a big improvement on useable trackage. I am anxious to see how well the new track manages over the winter. The composite ties should hold up well on the ground. Note: Family Garden Trains?, Garden Train Store?, Big Christmas Trains?, BIG Indoor Trains?, and BIG Train Store? are trademarks of Breakthrough Communications (www.btcomm.com). All information, data, text, and illustrations on this web site are Copyright (c) 1999, 2000, 2001, 2002, 2003, 2004, 2005, 2006, 2007, 2008, 2009, 2010, 2011, 2012, 2013 by Paul D. Race. Reuse or republication without prior written permission is specifically forbidden. Family Garden Trains is a participant in the Amazon Services LLC Associates Program, an affiliate advertising program designed to provide a means for sites to earn advertising fees by advertising and linking to amazon.com.